The end user is a commercial building in one of Mumbai’s very well-known planned business districts and prominent commercial hub. The client was installing a sewage treatment system in the premises to recycle the building sewage. The treated sewage water was to be recycled for flushing and gardening purposes. 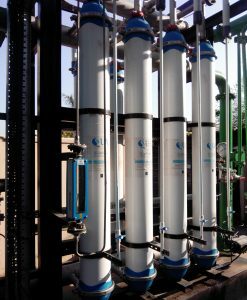 Ultrafiltration (UF) was required for tertiary treatment to provide consistent product water with a low silt density index (SDI) of less than 3 continuously. A major concern here was that the feed water to UF is a mix of sewage from the complex and cafeteria wastewater. The cafeteria waste has 2ppm oil, which may make the UF fiber hydrophobic and create problem in filtration. The client looked at various UF options and finally selected QUA’s Q-SEP UF membranes because of the high pore density of their fibers, which makes QSEP more tolerable to oil and gives more consistent water quality. Q-SEP® hollow fiber UF modules contain membranes manufactured with QUA’s innovative patented “Cloud Point Precipitation” method. This process ensures a high pore density along the length of the fiber and uniform pore size distribution in the membrane. 95% of the pores in Q-SEP fibers are of the size 0.02 micron. Q-SEP modules deliver superior performance characteristics and product water quality that surpass the quality from conventional UF modules. The uniform pore size distribution allows the membrane to produce water with a low silt density index (SDI), which leads to less frequent and easier cleaning of downstream RO membranes. The Q-SEP UF system has been operating successfully for a year and half now at this commercial building, and is giving consistent water quality, of turbidity less than 1 and SDI less than 3, in spite of the oil in the feed mix. The membranes are running at a flux of 60LMH, which is considerably higher when compared to the other manufacturer’s membranes. 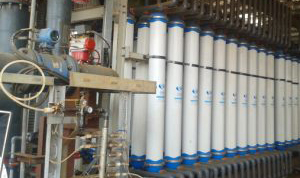 This has resulted in reduced number of membranes and saving in capex, thus benefitting the client.